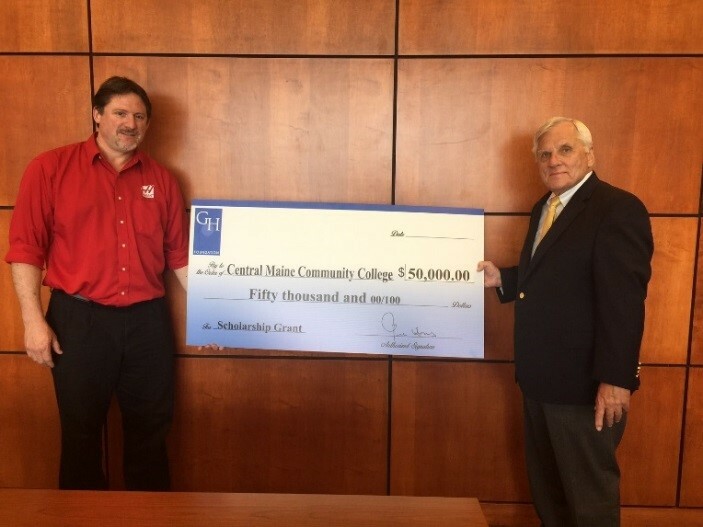 The Gene Haas Foundation has donated $50,000 to the CM Education Foundation for the 2017-18 academic year. These funds will provide scholarships to new and continuing students in our Precision Machining Technology (PMT) program. The Haas Foundation has contributed over $150,000 to the College and Foundation for scholarships in the last several years. Founded in 1999, the Gene Haas Foundation has awarded more than $45 million to more than 2,000 charitable organizations and schools since 1999. The Foundation is committed to U.S. manufacturing and supporting manufacturing education in the form of scholarships and other support for CNC machinist training. Photo: Marc Lapointe, left, a Haas CNC sales associate, presents a check for $50,000 from the Gene Haas Foundation to President Scott Knapp.